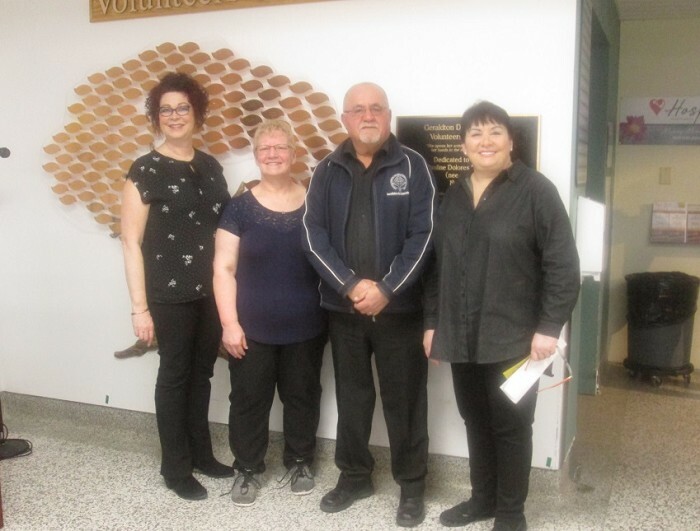 The Geraldton District Hospital hosted the annual Volunteer Appreciation Social that was held on April 8, 2019, at 7:00pm; at which time the Volunteers’ Tree of Life Recognition Awards were presented. 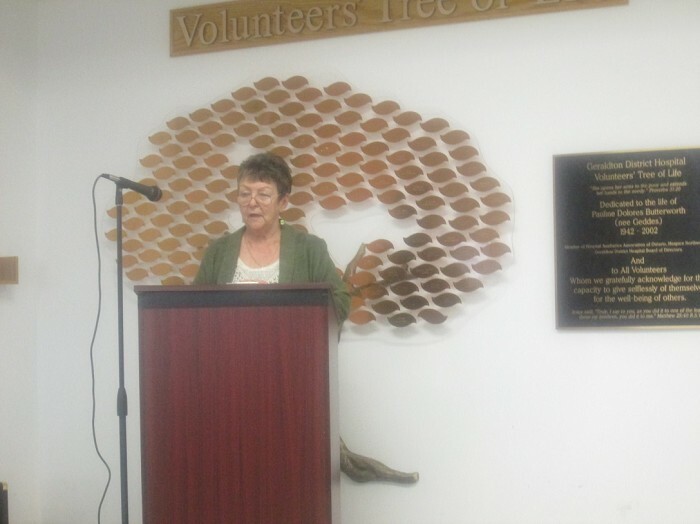 The Volunteers’ Tree of Life was dedicated to the life of Pauline Dolores Butterworth (1942-2002) due to her commitment to the hospital and patients. She volunteered tirelessly. After her death, her husband Rev. Gerald Butterworth dedicated funds to begin the official ‘Tree of Life Recognition Award’. It is located in the main lobby of Geraldton District Hospital. There is a list of criteria that the nominated individuals must meet that the Selection Committee reviews prior to making their selection. An Ad Hoc Hospital Committee comprised of hospital employees and volunteers, is struck to both formalize and maintain consistency in the process of nomination and selection of recipients of this award. Victor (also affectionately referred to as ‘Chico’) was first elected to the hospital Board of Directors in 2011. He has been a valuable member of the Board for the last 8 years, and has sat on the Quality Improvement Committee and served on the Nominating Committee for many years. Chico has first-hand knowledge of what Long Term Care entails as both his parents were residents in the John Owen Evans Residence. He was also a member of the Board of Directors for the Norwest Community Health Centre for six years. He has faithfully attended the annual regional hospitals’ retreats held in various communities and the Rural and Northern Health Care Leadership Conference in Toronto. Overall, in the last five years, Chico has exceeded the criteria of dedicating 390 hours of volunteer service. On a personal note, Chico volunteers for the Longlac Fire Department, he helps to organize the Longlac Seniors’ Curling Club and its annual Bonspiel. And perhaps most importantly, he’s a good neighbour, by helping to cut grass and shovel snow for a few residents in Longlac that require assistance. His favourite hobby is fishing, fishing and more fishing! Yvonne was born and raised in Geraldton and recently retired from working at the TD Canada Trust after a forty-six (46) year career with them. She has been actively involved with the residents in the John Owen Evans Residence for the past six years when her mother became a resident. She also enrolled in the Hospice Northwest Palliative Care Training Course and successfully completed it in 2016. As a palliative care volunteer, Yvonne visits clients, assists with recreational activities in the LTC facility and sits with those who are on their end of life journey. She has given freely of her time logging 452 hours in the first year and an average of 250 volunteer hours for the past two years. She brings a cheerful presence and actively engages the residents in conversation during coffee time and encourages them to participate in various activities. She also takes a monthly shift in the Sunshine Gift Shop located in the hospital as part of the Hospital Auxiliary. Yvonne also gives freely of her time for various other community activities, such as being a member of the Board of Directors for the Northern Horizon Medical Clinic, she supported the Local Air Cadets for the seven years her children were involved and then spent an additional two years as a Civilian Instructor. Yvonne is also wonderful with animals, as she has a soft spot for the homeless cat population in Geraldton. She has adopted and looks after too many to mention here, but they all know her and her warm affection for them…. she is Geraldton’s official cat lady! It is with pleasure that these 2 names be permanently inscribed on a gold leaf on the Volunteers’ Tree of Life, located in the front foyer of the hospital. I would like to send my sincere congratulations and thanks to this year’s recipients for their tireless work in our community! It is because of the commitment of all of our volunteers, that our communities are able to grow and continue to thrive, even during our challenging times!